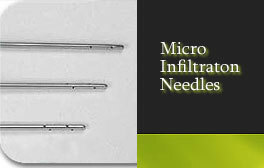 Becon's Disposable Micro-Infiltration needles can be used to rapidly and evenly infiltrate tissue without the dangers of cross contamination. Long, high-quality, German stainless steel shafts are bonded to a resilient, tough, plastic Leur-lock hub connector for an instrument that performs as well as any non-disposable on the market. The blunt virtually atraumatic bullet tip is available in a popular spiral pattern allowing precision control in the operative site. A variety of lengths and gauges are available. Our disposable micro-infiltration needles with a spatula style tip can be used for injection and undermining at the same time.